A farewell reception was held for veteran hotelier and Kerzner International VP J Barrie Farrington at Atlantis Paradise Island January 21. Read Prime Minister Perry Christie's remarks here. 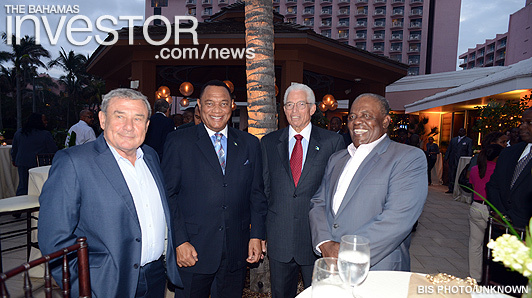 Pictured: (left to right) Sir Sol Kerzner; Prime Minister Perry Christie; J Barrie Farrington; and former Prime Minister Hubert Ingraham. I am pleased to have this opportunity, personally and on behalf of the Government of The Bahamas, to express appreciation to Barrie Farrington on the occasion of his retirement from Kerzner International where he has held the position of Senior Vice President for very many years. In fact, for forty-one (41) years, Barrie has been a fixture at this Atlantis property and its various predecessor-resorts – some six in all. He has contributed greatly to the success of these resorts over the years, imparting his wisdom and insight and giving dedicated, loyal and efficient service throughout his tenure. This is an extraordinary record of longevity in the private sector. Small wonder, then, that Barrie is widely known as “the ultimate survivor”. In fact, in the course of 41 years, he has survived not only six changes of ownership but four changes in government too! Yes, Barry has seen a lot of players come and go – and, in some cases, come back too! But the point is that Barrie’s record of longevity speaks to the consistently high degree of reliance that successive resort owners on Paradise Island have placed on him and his wisdom and skills over the years. The other remarkable aspect of the Barrie Farrington story is that even though he always had a full-time job at Atlantis, Barrie still found time to serve his country and the tourism industry in a variety of important positions that took up a lot of his time with very little, and in some cases, no material reward at all. Barrie holds the unmatched distinction of having served thirty-one (31) terms as President of the Bahamas Hotel Employers Association. 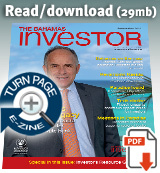 He is also President of the Bahamas Hotel Industry Pension Fund and a Trustee of the Bahamas Hotel & Allied Industries. In addition to his many corporate responsibilities and contributions to the hotel industry, Mr. Farrington has displayed a keen sense of public service, having served as chairman or a member on numerous Government Boards and Committees, including, most notably, Bahamasair and Bahamas Electricity Corporation. Barrie has also been an important contributor to sporting development over the years, going all the way back to the ’50s and ’60s. He has been a particularly great contributor to the development of the sport of tennis; a sport in which he is credited with great personal success as a competitor himself–as also his son. Our nation should always be grateful to Barrie for his generosity in helping to promote young tennis players and in establishing the tennis courts at the Queen Elizabeth Sports Centre. Barrie is a shining example of what Bahamians can accomplish through hard work, integrity, reliability and dedication. His stellar achievements and contribution to the public good have been recognized by the award of the Cacique award and the Queen’s honour of CBE. As you begin your retirement, I wish you many more years of good health, prosperity and continued public service to the nation that you have already served with such distinction.